NEW YORK - FEB 11, 2015: 5th Ave bus with Empire State Building and bare trees in cold winter in slow motion 4K in Manhattan, NYC. Empire State Building is a 103-story skyscraper in New York City. hd00:28Leaves falling from trees on autumn day outside old white stone mansion with fog, wind and rain. 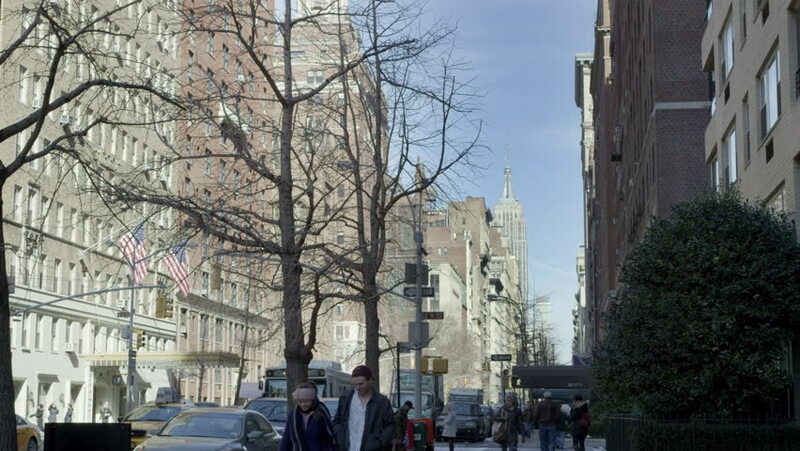 hd00:28SOHO establishing shot, New York City. hd00:27NEW YORK - DEC 15, 2015: NYU building and Christmas trees with Freedom Tower in background from Washington Square Park in holiday season with bright sun glaring, NY. Manhattan is famous for landmarks.